"You know, for a frog, you have pretty cute legs." "Really? 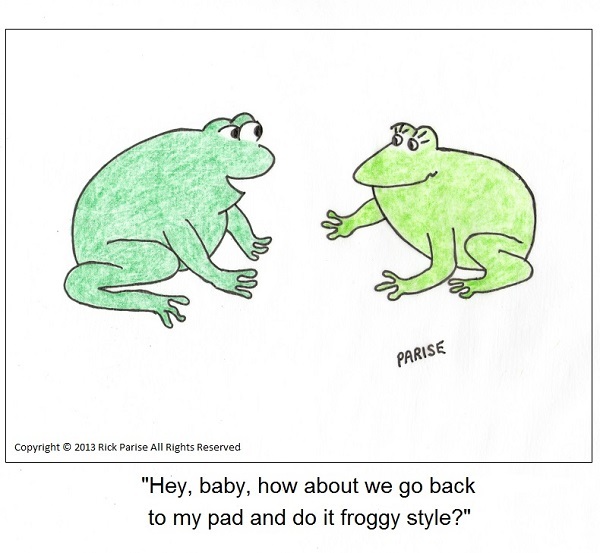 Well, for a frog, I'd like to hear you croak and then see you croak." "Aw, come on, I'd just like to get to know you. Can I buy you a drink?" "Sure, why not? I'll have a glass of Chardonnay. And there better be a fly in it!" "You got it, baby. By the way, my name's Kermit." "Kermit? That's pathetic." "Don't I know it. I'm afraid my parents had a sick sense of humor. So what's your name, sweetheart?" "Let me get a couple of drinks and a couple of flies under my belt and maybe I'll tell you." "So, playing hard to get? I like that." "I'm sure you're use to it." "Why do you say that?" "Let's just say I don't see you turning into a prince no matter who kisses you." "Ouch!" "Sorry, I like to be honest." "That's okay, I wouldn't want to be a prince anyway. I like being a frog." "You know what? So do I." "Really? So maybe we do have a future together." "Easy, boy, don't hop to conclusions." "Sorry, but when I saw the way you tongued that fly, I got carried away." "Oh yeah? Well, keep talking like that and you'll be carried away all right." "Ouch again! Sorry. Again. Can I get you another drink to make up for my faux pas?" "Wow, a frog that speaks French. I'm impressed. I think I'll call you Frenchy instead of Kermit. And, sure, I'll take that drink." "My pleasure. So now will you tell me your name?" "Sure, why not? It's Lily. Lily Pad." "Lily Pad? Are you serious? Sounds like we must have had the same parents." "Of course we had the same parents. How big do you think this freakin' pond is, anyway?"